It’s not the holidays without food! And while our to-do lists, shopping lists, and meal preparation lists may be long this time of year, it’s important to not forget or skimp on the favorite part of the meal: dessert. Sometimes a cookie or piece of cake could use a little extra “wow” factor and that’s where we come in! Here are some of our favorite ways to use candy in cooking and baking this holiday season. 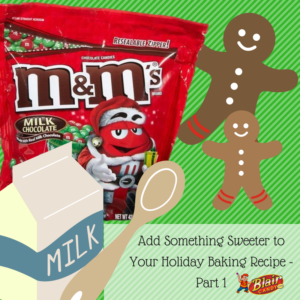 Brownies: Brownie batter is a great opportunity to mix in some sweet treats, like M&M’s! These candies are colorful, crunchy (and delightfully melty if you bite into your brownie soon after it comes out of the oven!). We recommend purchasing M&M’s in bulk, since who knows how many batches of sweets you may need to make? You can purchase M&M’s in bulk and other candies mentioned here from the unwrapped candy section on our website. Thumbprint Cookies: Who can forget about thumbprint cookies? These cookies are usually a sugar or peanut-butter dough and have a craved-after candy in the middle. You could go with the traditional Hershey’s Kiss as the topping, or you could switch up the recipe with chocolate covered peanuts or pretzels. Trail Mix: Trail mix is a quick snack option for holiday shopping, cocktail parties, or other events on your Christmas calendar. Combine salty snacks like peanuts and pretzels with Whopper pieces. These are fun treats for family members of all ages. Plus, it can be an easy addition to any coffee or dining room table as a centerpiece! We love variety, and while traditional dessert recipes are go-to’s for the holiday season, spice it up this year — mix in some whole or chopped candies to your dessert recipes. Shop now at BlairCandy.com and stay tuned for part 2! During the holidays, your candy dishes tend to work overtime. Be sure you have everything you need to keep them filled all season long. These are a few bulk Christmas candy treats that everyone who visits your home will love. Hershey’s Kisses are a clear favorite during the holiday season. With red and green wrappers, they stay fresh for the entire holiday season and look festive too. Dove chocolate paired with peppermint bark makes a delicious holiday treat. These bite-sized chocolates are so great, we suggest you get another bag! Reese’s peanut butter cups are delicious no matter what time of year it is. These festively wrapped mini cups are perfect for filling the candy dish and for gifting. Everyone loves gummy bears, so these red and green Haribo Gummy Bears will be a welcome addition to the festivities. They’re also great for decorating gingerbread houses. Shop all bulk Christmas candy today to make your holiday a little sweeter. 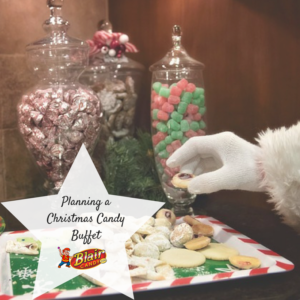 You can find everything you need to make sure your candy dishes stay full and ready for Christmas fun! For the Tootsie Roll fans, these fruity Tootsie Rolls will be a big hit. Plus, they can use the container as a coin bank after they’re done with the candy. Peeps aren’t just for Easter anymore and these packages prove it. These hot chocolate Peeps are great alone or in hot cocoa, which makes it a great stocking stuffer. Ugly holiday sweaters make a great gift so these chocolates will make everything more festive. These crispy chocolates will be a great treat as they unwrap their gifts. This stocking stuffer is two gifts in one. Bean Boozled has both sweet and gross flavors that will surprise players of all ages. This gift will also lead to hours of family fun. 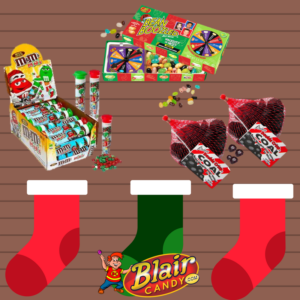 Start shopping all candy stocking stuffers today and get ready to spread the holiday spirit! From classic candy to fun, festive flavors, you’ll find something for everyone. Black Friday is this week! While you’re planning your holiday shopping haul, consider stocking up on these candy in bulk finds. Lunchbox Snacks – Stock up on everyone’s favorites during Black Friday. Save yourself some time during the holiday rush by stocking up and having it delivered to your door. You may also find some treats to surprise your kids with while you’re shopping. Party Candy – Have an event coming up? As long as you leave you candy unopened, in a cool, dry, non-refrigerated place, you can keep candy fresh for about 2 months. This way you can get everything you need for the big event, without breaking your budget. 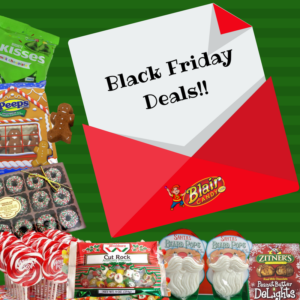 Holiday Gifts – Use Black Friday to get a jump on the candy lovers on your shopping list. You can get everything from their favorite candy bars in bulk to nostalgic candy gifts that are ready for gifting. Start making your list and check it twice before Black Friday! Be sure you’ve subscribed to our emails so you can get the Black Friday deals before everyone else. Start looking at all of our candy in bulk to start planning your candy haul. First, how many guests will you have? Be sure to plan to buy enough candy for at least a pound of candy a piece. This doesn’t include any novelty treats or baked goods. For those, you should plan on at least one treat per guest. Next, start designing a table. You should choose a variety of glass bowls, apothecary jars, and cake stands to display your treats. The more variety you choose, the more appealing your table will look. Also, choose a color theme to base your candy and decorations off of. Finally, assemble your table. Add labels to every jar and plate to show your guests what they’re about to enjoy. Wait to place baked goods until about 10-15 minutes before guests arrive, to ensure they stay fresh. You can also place serving utensils in the bowls and jars at that time. Additionally, be sure you have goodie bags so your guests have an easy takeaway favor for later. This article from Quinceanera.com breaks down everything you need to plan your table. 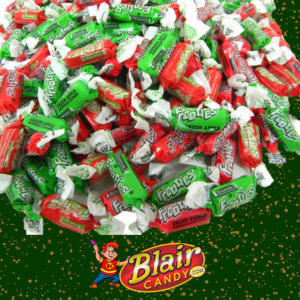 When you’re ready to get your Christmas candy in bulk, visit us at BlairCandy.com. We have all of the treats you need, from retro to new favorites to stock your candy buffet. Everyone will gather around this cheese ball during halftime. The Game Day Chocolate Chip Cheesecake Ball goes great with vanilla wafers and pretzels for a sweet and salty treat. See how to make it on the Belle of the Kitchen blog here. Puppy chow, snack mix…no matter what you call it, everyone will love this game day mix. This is made up of almonds, cereal, and whatever colored candies you choose for a grab and go snack. See the recipe on The First Year Blog here. If you forgot about the big game and have a box of brownie mix and white icing on hand, you’re all set to make this recipe. See this super simple recipe by visiting the Betty Crocker Blog here. This treat takes a little more time than the others, but your guests will definitely love them. These Game Day Peanut Butter Cups take Reese’s cups, chocolate football candy, and green icing. See how to make these on Tablespoon here. 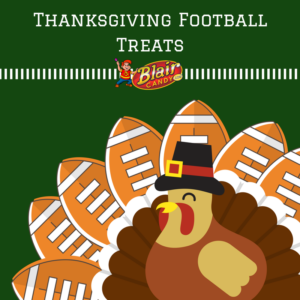 Plan ahead and visit BlairCandy.com for all of the holiday and football candy you need this season. Don’t forget to tag us in your creations on social media. Happy Thanksgiving and happy football snacking! 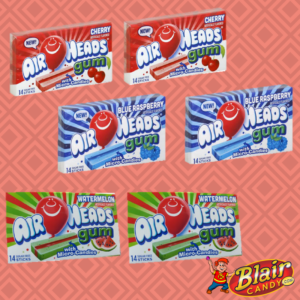 AirHeads Gum (Pictured): If you enjoy AirHeads candy, then get ready for Airheads Gum! Grab a pack in cherry, blue raspberry, or watermelon for a true piece of gum that will give you midday pick me up. Pop Rocks Candy Cane Flavor: Can’t wait for Christmas? These Pop Rocks have a bold candy cane flavor that any peppermint fan will appreciate. Trolli Sour Gummy Octopus: These will be a welcome treat for sour gummy worm lovers. Each bag of these Trolli Gummy Octopi has the flavors you love in fun shapes. Zitner’s Krak Kringle Eggs: Speaking of the holidays, these eggs will be the talk of the party. 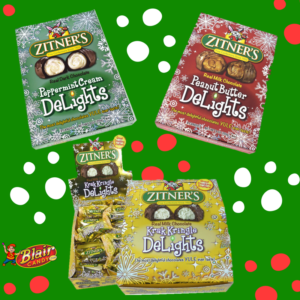 Zitner’s classic eggs have been revamped for the holidays and feature three classic flavors. Ready to try something new? Visit our website today to see more of these new candy treats and other new products. Be sure to tag us on social media when you’ve tried something new and let us know how you liked it! Did You Know These UK Candy Facts? 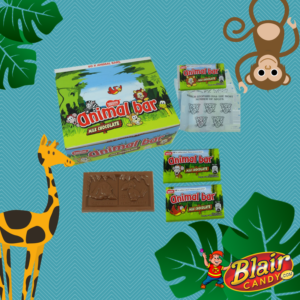 The Animal Bar (Pictured) is a milk chocolate bar that has two different animals imprinted into every bar. These fun candy bars contain no artificial colors, flavors, or preservatives for a pure chocolate treat. This bar has been delighting both children and adults since 1963 and will continue to for years to come! Bubbly texture and a melty chocolate taste are what make Aero chocolate bars so delicious. This bar was patented in 1935 and originally started out in the mint chocolate flavor. The milk chocolate variation didn’t hit stores until the 1970s but has been a fan favorite ever since. Finally, the Bounty Bar has been a coconut lover’s dream since 1951. This bar has a large coconut filling and is covered in chocolate for a hearty snack. It’s been sold in other flavors around the world, such as mango and cherry, but the classic Bounty bar has always been a clear winner. Interested in trying one or all of these new UK candy bars? Visit BlairCandy.com today and see which of these bars will be your new favorite! Bulk Holiday Candy to Stock Up On! The holidays are almost here, so it’s time to start looking at your social calendar. When planning family dinners, parties with friends, and school functions, don’t forget the candy! We have tons of bulk holiday candy to make sure you have something sweet while you’re with those you love. Here are a few that we highly recommend stocking up on…because quantities go quickly! Zitner’s Krak Kringle Eggs – Who can resist one of these classic treats? Choose from the classic Krak egg, chocolate and coconut, or from the peppermint and peanut butter flavors for a delicious treat. Gingerbread House Kits – Make sure you have one kit per child and extra candy on hand for Gingerbread House decorating! This is the perfect activity for when it’s a little too cold to go play outside. Candy Canes – Whether you’re using them to decorate or passing them out in a parade, we have all of the candy canes you need. Grab a box of classic peppermint candy canes or a box of colorful, fruit-flavored canes for a fun twist. There’s plenty of bulk holiday candy to go around! 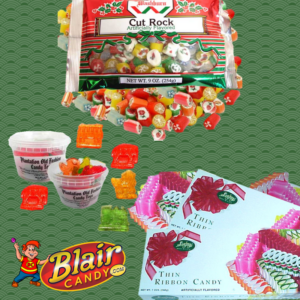 Shop all retro and new holiday candy treats today at BlairCandy.com and celebrate the holidays early.